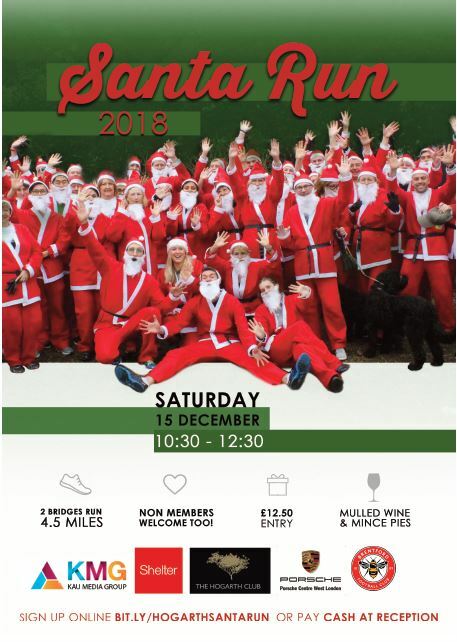 KMG are one of the official sponsors for the Hogarth Health Club Santa fun run. They are our local leisure club, and our KMG team members play Squash there regularly. They are fundraising whilst exercising, so this is an event that resonates with our healthy and active KMG culture. In addition, their chosen charity supports our previous volunteer work feeding the homeless and is a cause close to our hearts. Shelter helps millions of people every year struggling with bad housing or homelessness through advice, support and legal services. There are 128,000 homeless children across the UK right now and this is not acceptable. The Ho Ho Hogarth Santa Run is back as members and non-members are welcomed to a very special charity event on Saturday 15th December at 11am. We will be raising money for the homeless charity Shelter, dressed as the big, red, bearded man himself. From the Hogarth we will do a lap of the river around the two bridges. It is 4.5 miles of great joy for a great cause this Christmas. KMG have officially sponsored the event. Join us and sign up or donate today.